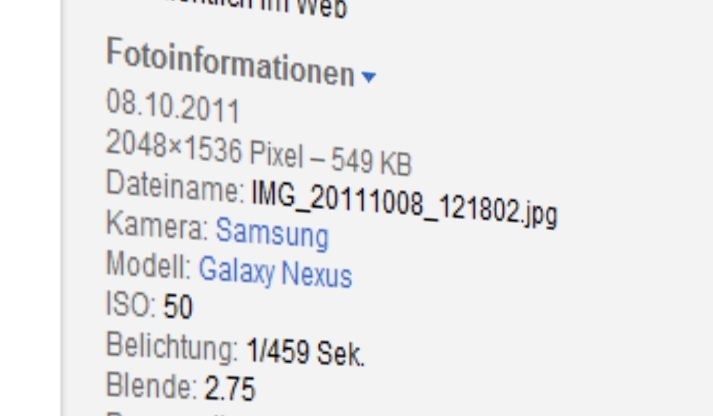 Samsung Galaxy Nexus Mentioned in Photo EXIF Data, Buying That Name Yet? In case you need additional proof that the next Nexus will be known as the Galaxy Nexus when launched, look no further than the photos uploaded to Picasa from a couple of Google employees – one of which works on the Android team. The EXIF data, which you can see above, clearly states the name that we expect to be attached to the phone come launch. The photos only weigh in at 3MP, but don’t be worried by that. It could easily have to do with the service that was used to upload the photos or maybe these photogs aren’t into 2MB file size shots. Everyone OK with the Galaxy Nexus? Nexus Prime sounds all robotic and transformer-like, but remember that we saw a merging of Samsung and Google brands last year with the Nexus S. Now, if only we could get a reschedule date for the event that was originally planned for today and we could get on with our lives. To see the photos, hit up the source link.